I like the castles. I like the cloaks. I like war and corpse painted, iconoclastic figures wielding weapons and spikes in the coldest forest available. Has it gotten tired, or played out by the year 2010? Almost definitely. But there's just some tangible, impossible majesty to it all that has tipped off endless imaginations (and with any movement, hatred). 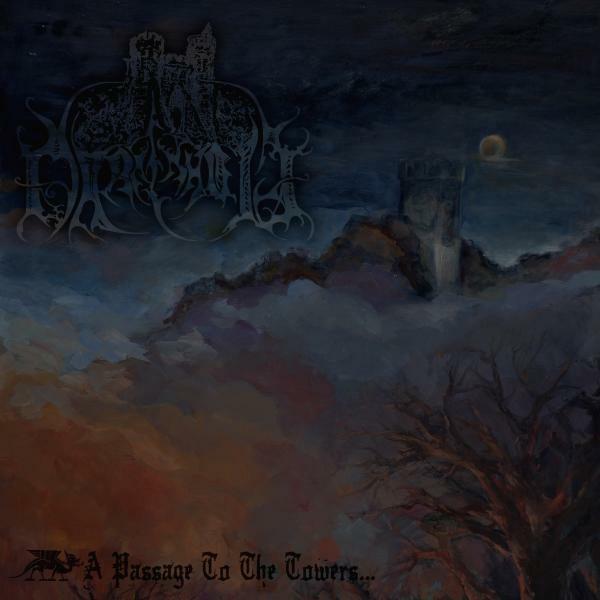 The reason I mention all this blathering is because the French band Darkenhöld seems such a perfectly glorious proponent of the grandiose, the unreal, the archaic and arcane. Their debut is A Passage to the Towers... not only in name, but in content, for these tracks fire up the synapses and open gates directly to the harbored, lofty spaces standing abandoned in the soul, through streaming, ripping melodic black metal that recalls Immortal and early Emperor, or other acts that retroactively herald the ancient habitats of kings and conquerors. There is nothing quite 'new' about what they bring to the genre, they're simply very effective at what has been manufactured previously. A Passage to the Towers... collects the material from the band's previous splits, and splices it in with newer compositions for a truly consistent and wondrous experience with excellent production, memorable guitar lines and the ghastly if typical rasp of 'Cervantes' (once of fellow Frenchmen Artefact). Synthesizers drift across the horizon, and the thirst for uplifting black metal is very easily quenched with the surging "Citadel of Obsidian Slumber", the warlike awnings of "Marble Bestiary", or the cavalier charge of "Chains of the Wyvern Shelter". Fantastic images of castles and mythological beasts tower upon the listener, relics of an epoch not of history, but of unfettered imagination running free. It's not quite what one might expect of most French music of its type, hailing from a land of the unusual and surreal sounds of Deathspell Omega, Blut Aus Norde, and Peste Noire, but its effective in an entirely different light. You get the same feeling listening to this as you do when the cameras pan across the vast landscapes in fantasy films like Lord of the Rings, or the more moody and minimal majesty of Summoning, though Darkenhöld are somewhat louder and more accessible, cautiously merging each melody within the constriction of its aggressive blast beats or pinnacle climbing keyboards. There's nothing 'silly' about the album, necessarily, but it's a great pleasure to listen through, and I do hope there's not enough backlash against such a strain as this that it will be ignored.